MOSCOW, December 9. /TASS/. A Russian Su-35 multi-role fighter jet shooed away a U.S. F-22 stealth tactical fighter aircraft from a pair of Russian Su-25 fighters in an incident in Syria’s air space, the Russian Defense Ministry said on Saturday. "On November 23, in the air above the western bank of the Euphrates River, a U.S. F-22 fighter hindered actively Russia’s two Sukhoi-24 attackers in fulfilling their combat tasks to destroy a command station of the Islamic State (IS, terrorist organization outlawed in Russia - TASS) near Mayadin," spokesman of the Russian Defense Ministry Igor Konashenkov said. "The F-22 fired heat flares and released braking flaps, constantly maneuvering, to simulate a dogfight." The F-22 Raptor "halted dangerous maneuvers and hurried away into Iraq’s air space" after the Russian Su-35S highly maneuverable aircraft appeared nearby, Konashenkov said. "The U.S. side regarding this and many other incidents in the air above Syria has not offered responses to the Russian command at the Khmeimim base," he added, advising Pentagon officials to concentrate on their fight against Islamic State terrorists in Iraq rather than on provocations in the air. Earlier, the New York Times wrote citing Pentagon officials that Russian aircraft had allegedly flown dangerously close to American warplanes in eastern Syria. Most cases of dangerously close flights of the Russian and U.S. aircraft in the Euphrates area were related to the U.S. hindering destroying of the Islamic State militants, the Russian Defense Ministry said. 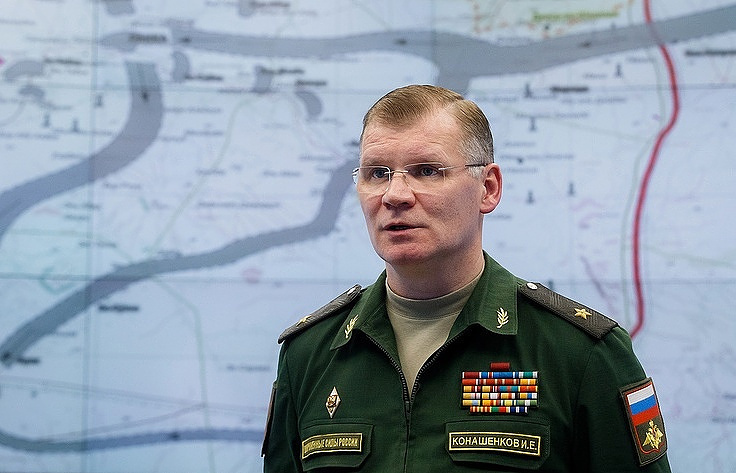 "Most proximities of the Russian and U.S. aircraft in the area of the Euphrates were caused by the U.S. attempts to hinder elimination of the IS (Islamic State, outlawed in Russia) terrorists," spokesman of the Russian Defense Ministry Igor Konashenkov said. "Statements of the U.S. military’s representatives about a part of the Syrian air space, which belongs to the U.S., causes bewilderment," he continued. "The Pentagon should remember that Syria is a sovereign country and a UN member, thus the U.S. has not had ‘its’ sky here, and may not have." "Unlike the Russian Aerospace Force, the U.S.-led ‘international coalition’ is acting in Syria illegally," he added.